The other day I was walking in Knowlton and was literally hypnotized by the beauty of an apple tree in blossom. The sunlight was peeking through the branches and the delicate goassamer skin of the white petals glowed in a magical sheen. The darkness of the background made a great picture I think. One of the benefits of living in the natural beauty of Knowlton is being able to find so many deliciously natural beauty all around us! With the heat coming back we start to plant our gardens and watch as poppies bloom and burst into colorful pageantry. The perfumed moist air of June is a magnificant tonic for the soul and makes us all appreciate the life we enjoy nestled here in a quiet little section of God's green earth. 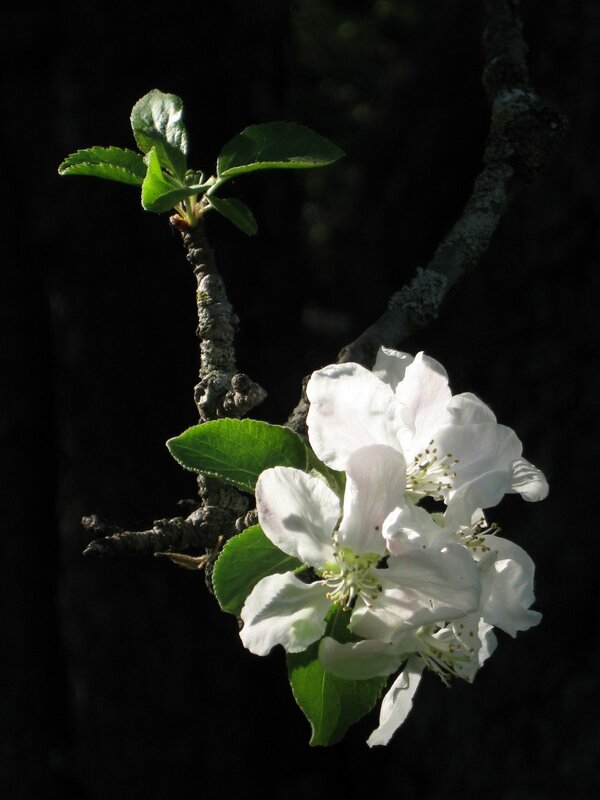 Such moments often bring back the memory of a beautiful piece of poetry that has touched us and after seeing the glorious apple blossom I was reminded of a poem by e e cummings that has always been one of my favorites.